Initially there is one column for Parcel1. To add columns for more parcels, the number of parcels can be entered using the dropdown box or the Show Rows & Columns can be used to show all 10 columns. If an image is too small to read on this page, simply select the image to view it in it's original size. There are some important data items on the Site worksheet. It is very important that these data items be updated for the subject property. Enter concise, single sentence highest and best use conclusions here for the site and the property as vacant or improved. The conclusions are reported in the Summary of Salient Facts section. Use the comments section to add detail, or write supporting narrative in the Word document. 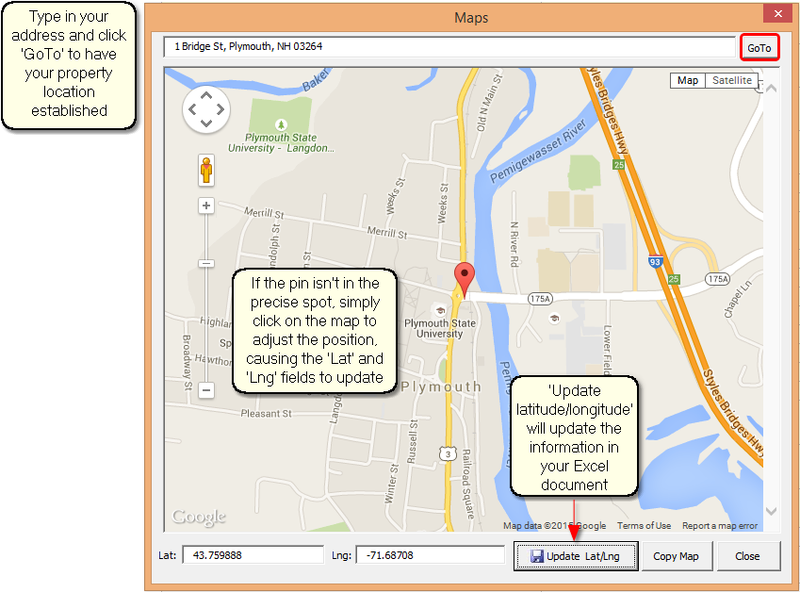 Use the Google Maps feature to find the latitude and longitude of the subject property.This is done by clicking on the Location Map Settings button in the button group in the upper left corner of the worksheet. 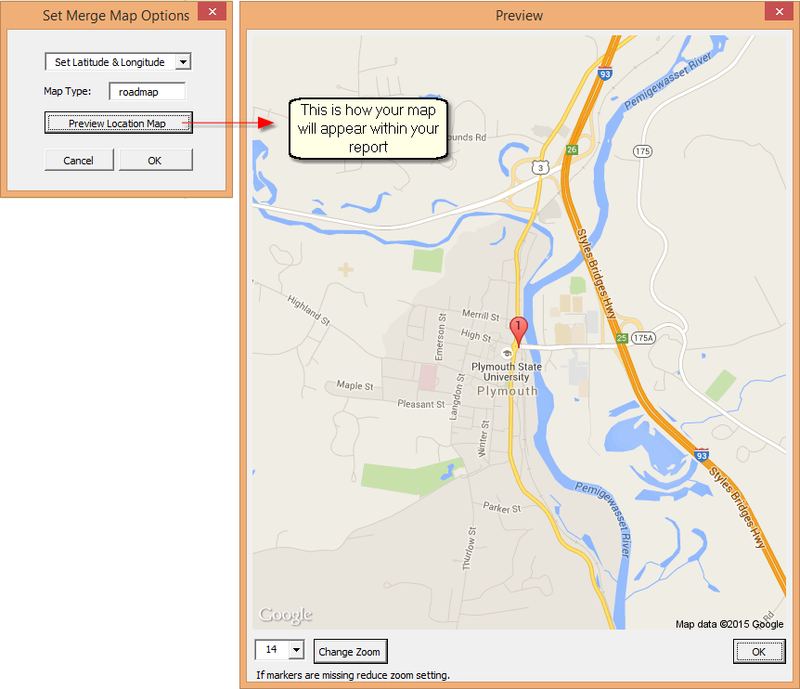 These fields are used by Narrative1 for to automatically create subject location and comparable comp maps using Google Maps. See the section below or see the help article for Location Map. Narrative1 has powerful tools to geo-code property locations and automatically generate subject location maps for Parcels 1-10. These categories each have two data entries: a short entry and a long entry. The short entry populates the adjustment grid and database, where short entries are appropriate for the display area. The long entry merges to Word and can be as long and detailed as desired. In regard to an improved site, the land not needed to serve or support the existing improvement. In regard to a vacant site or a site considered as though vacant, the land not needed to accommodate the site's primary highest and best use. Such land may be separated from the larger site and have its own highest and best use, or it may allow for future expansion of the existing or anticipated improvement. Similar to short and long description fields, for analysis grid and database purposes, Narrative1 automatically combines the individual utility entries in a single field. The formula can be over-written with a different or more succinct summary description. Click the "Show Database Column" to show the site information that will be saved when the subject property is saved as a database record (optional). This can ignored if the subject is not being saved as a database record. Because there are potentially several parcels (up to 10) associated with the subject, Narrative1 gives the analyst a choice of how to organize the data as a single database record via the Method selection, if there are multiple parcels. Note: If there is only one parcel, Narrative1 will automatically use the information from Parcel 1. Concatenate. 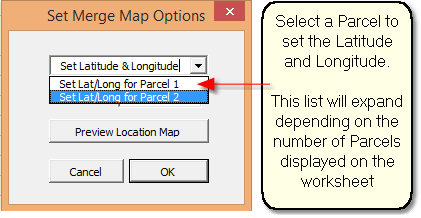 This method builds a text string comprised of the value entered for each parcel, separated by brackets and a number. For example " The current use is as an office building. The current use is as a retail building"
Note: If the Database Column and the Method Column are white, this indicates there is not a corresponding database field for this information. Not all subject information is necessary to create a database record. 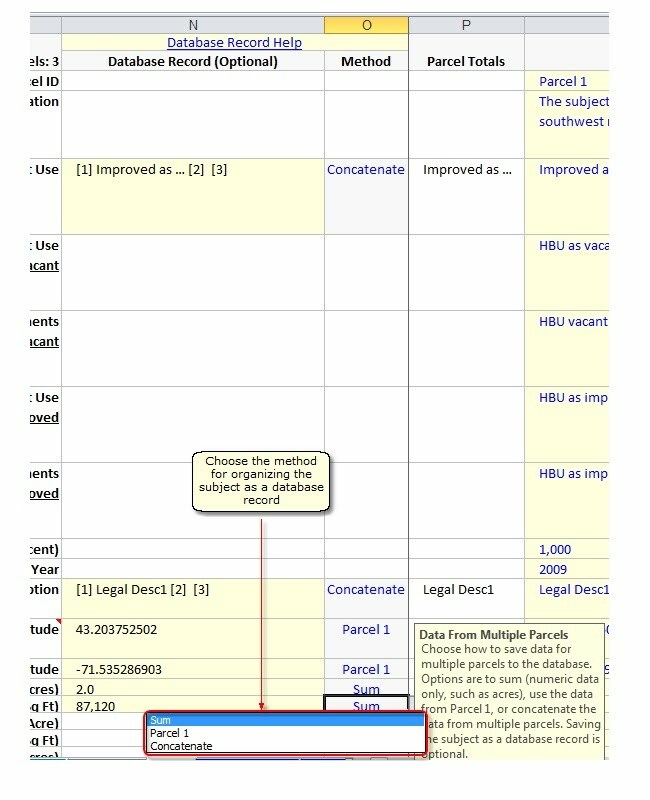 The Summary Table can be reached using the navigation buttons to the left of the Input Table at the top of the worksheet. 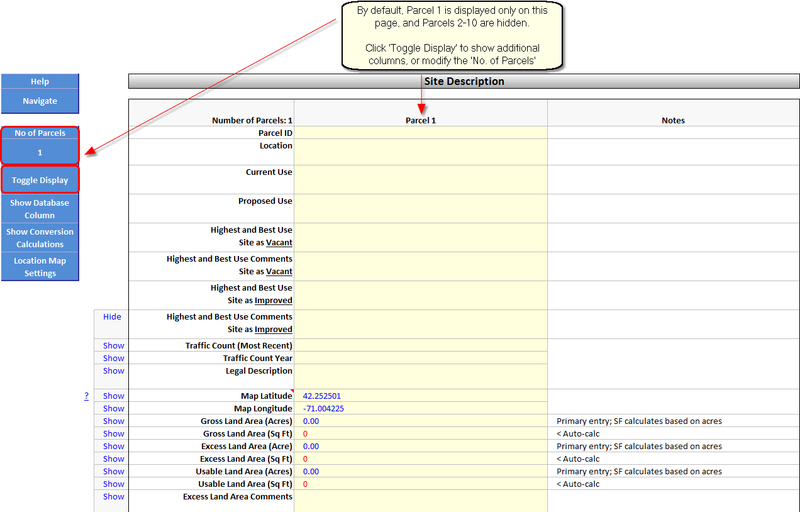 Either click on the (right) arrow, or select the Summary Table from the Go to... drop down. To return to the Input Table, the same applies: click either the (left) arrow or select the Input Table from the Go to... drop down menu. The illustration shows the navigation buttons and the Table Set-up button which toggles extra rows and columns as displayed or not displayed. Each row and column can be changed from Show to Hide, or from Hide to Show by clicking and selecting in the drop down box. When done designating any desired columns or rows as Show, click the Show Rows/Columns button to hide all the columns that were left as Hide. 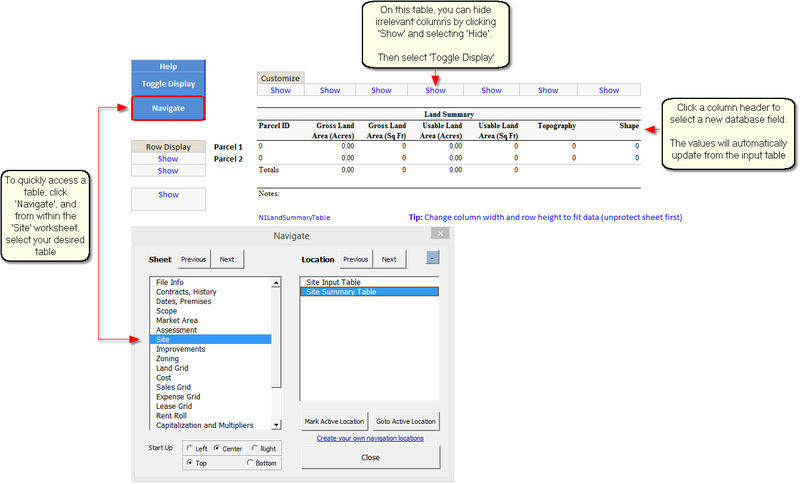 The table can be customized by clicking in a column header and selecting a new header value from the drop down list. The value associated with the header (field name) will automatically populate the column.